Pillars of Eternity II: Deadfire Update 48 - What's Next? The team at Obsidian is very proud of the reception that Deadfire is getting from the community, and we love reading and hearing your personal experiences as you explore the Deadfire for the first time. I would like to share what's in store for you in Pillars II over the next several months, including free content and new features! The first large update for Deadfire will be launching in early June - Patch 1.1. This update contains hundreds of fixes and refinements based upon our internal testing and all the great feedback we have been getting. Included in Patch 1.1 is a complete overhaul of Veteran and Path of the Damned difficulties. You'll find more enemies per encounter and with new level scaling adjustments the game should be much more challenging. Let us know what you think on the forums - this will be an ongoing process based on community feedback. Secondly, for players who want to play the game for a second (or third!) time, we are adding an option to skip the introduction and jump straight into the second scene. This option will be available on the new game screen and will not require any Berath's Blessings points to activate. Lastly, the team is also adding new cosmetic options for player customization with the ability to change character appearance at any time. While our programmers get Patch 1.1 ready, some of our artists and designers have had some time on their hands. They've put together the first of several free DLCs for Deadfire, "Rum Runner's Pack" which is coming out today. This pack features Mirke, a new Sidekick, along with a drunken personality idle animation and new alcoholic drinks. We will be releasing even more free DLC over the next few months that will add more items, ship upgrades, crew members, and appearance options. Look for the next free DLC to be available two weeks from now. Just like the first Pillars of Eternity, the team is committed to support Deadfire with new features, content, bug fixes, and polish to make the game the best it can be. We are listening to your feedback on our forums, Reddit, social media, and user reviews - and the development team has many ideas for improvement, too. Through 2018, we have plans to add more quality of life changes to make the game better and better. For the mod community, we will be releasing documentation on the game data formats, and will be working on tools to help facilitate mods. Another feature that the team is really excited about is what we are calling "Magran's Fires". Similar to Berath's Blessings, these modes can be enabled from the main menu and will add gameplay modifiers for challenges above and beyond Path of the Damned. In addition to the returning Triple Crown and Triple Crown Solo challenges, we will be rolling out challenges themed to Eora's gods, beginning with Berath, Galawain, and, of course, Magran. As always, we are listening to feedback on what you would like to see in future updates. Don't forget we have three expansive DLCs on the horizon. The first DLC, "Beast of Winter", is due to land this July. We will be showing off the new areas and content in the DLC soon! It's been an amazing journey, and we aren't done yet. Thank you for your continued support for Pillars of Eternity and Obsidian. 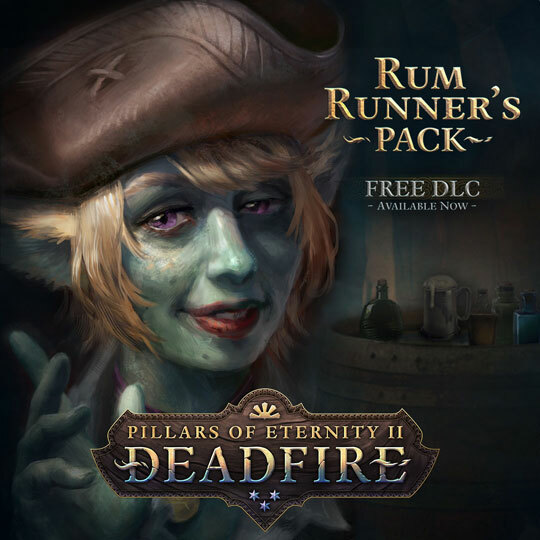 Now go forth, download "Rum Runner's Pack", and have a drink with your new friend Mirke. The Rum Runner's Pack is available now, so go grab it here.